48 • SPONSORED CONTENT • NOVEMBER 2018 Q. Discuss the importance of utilizing the appropriate equipment for catering operations. Tim Murray: In many cases, caterers are working with outdated equipment through no fault of the chef. Getting the decision makers to recognize the importance of the proper equipment to streamline their operations can be di- cult. By utilizing more current technology, caterers not only save on the bottom line food costs, but also decrease waste and energy consumption, increase yields, manage labor more eectively and in- crease product shelf life. When hot prod- ucts are chilled properly the shelf life is naturally extended and allows operators to prepare items ahead of time. While all caterers do advanced preparation, Irinox blast chillers are key in achieving every one of those goals. Q. What are common mistakes operators make when choosing blast chillers for catering? TM: Operators often purchase without totally understanding the equipment's true value. When you understand the potential of its use and how it can help make the customer experience better and ease produc- tion while maintaining quality, it makes sense to invest a little more money to achieve a faster ROI, long-term savings and a satisfied customer. Q. What are the most common ca- tering applications for blast chillers? 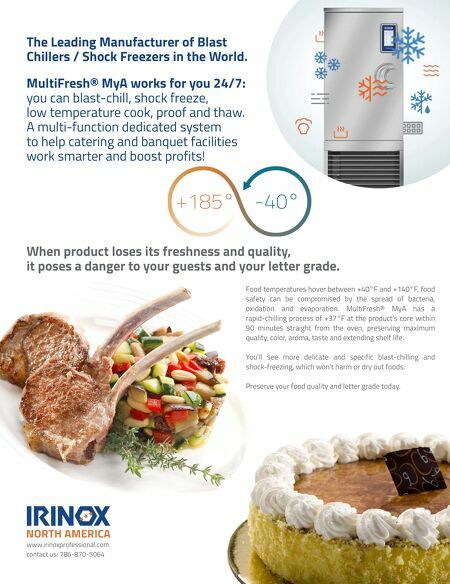 TM: Irinox MultiFresh (MF) or ICY series blast chillers quickly chill most products in 90 minutes or less directly from the heat source so that it reduces or eliminates carryover cooking and maintains the optimal flavor, color, texture, aroma, moisture and nutritional values. The food's natural goodness is locked in, so when product is reheated it tastes like it was just prepared. These units also are capable of shock freezing at -40 degrees F, as well. Operators can purchase seasonal or sale items, shock freeze to develop micro crystals, and serve that same product out of season but at the in- season quality and price. Q. What are the latest features available for blast chillers in catering that opera- tors may not be aware of? TM: The Irinox MF series is capable of reaching tempera- tures as high as 185 degrees F. The wide temperature range of -40 to 185 degrees F will allow caterers to low-tem- perature cook and automatically chill, freeze, or hot hold. Automatic proofing, thawing, reheating, hot holding and dehydrating cycles can also be performed within the MF series. Q. Talk about the importance of temperature control. TM: In catering sanitation programs, other than cleanliness, labeling and FIFO, health inspectors are concerned with temperature logs. Multiple temperatures need to be tracked mul- tiple times a day. Cooking, chilling and holding temperature tracking and log- ging can easily be forgotten and result in non-compliance of HACCP protocol. Irinox MF blast chillers will track and record temperatures throughout the chilling/freezing/cooking and automatic holding stages. Irinox MF is capable of automatically recording and then wirelessly sending this data to a remote location. Proper chilling and tempera- ture monitoring reduces liability, which is a huge factor in the catering industry. 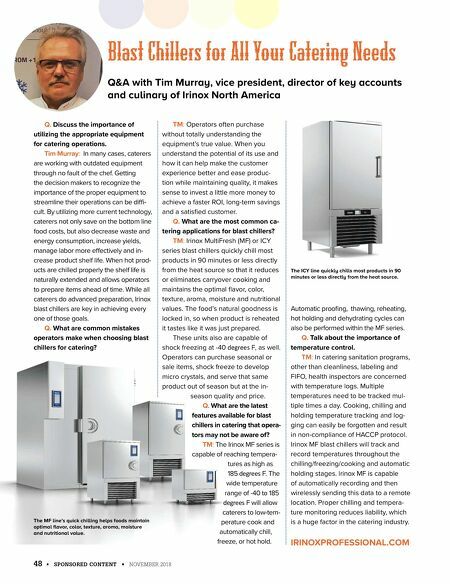 Bla ler l our Cater g Need Q&A withTim Murray, vice president, director of key accounts and culinary of Irinox North America The MF line's quick chilling helps foods maintain optimal flavor, color, texture, aroma, moisture and nutritional value. IRINOXPROFESSIONAL.COM The ICY line quickly chills most products in 90 minutes or less directly from the heat source.